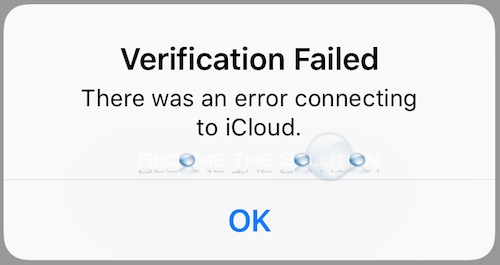 If you attempt to sign-in to iCloud on your iOS device, you may receive a verification failed message. This error appears to happen frequently if you recently signed out of iCloud on your iOS device. If you try signing into iCloud a 2nd or 3rd time in this case, most are successful logging in. However, if you are still unable to login perform the following steps below. Go to Settings -> General -> Date & Time and ensure Set Automatically is enabled for your correct time zone. Try to login to your iCloud account. On your iOS device, enable and disable Airplane mode and try to login to your iCloud account. Connect your iOS device to a Wireless network and try to login to your iCloud account. On your iOS device, reset your network settings in Settings -> General -> Reset -> Reset Network Settings. All else, end all apps on your iOS device and reboot it.